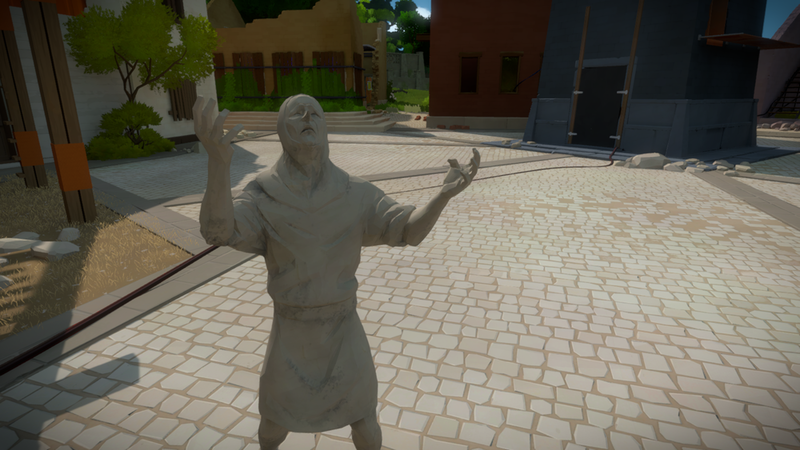 Spoiler warning: This post contains early-game spoilers for The Witness and Baba Is You. If you can, I would recommend playing the games yourself first, but I tried not to spoil any of the later-game stuff. You solve a panel by clicking on it and drawing a line from the starting circle to the exit notch. The goal is to walk around, explore the island, and solve all the puzzle panels. Currently, I am playing Baba Is You. 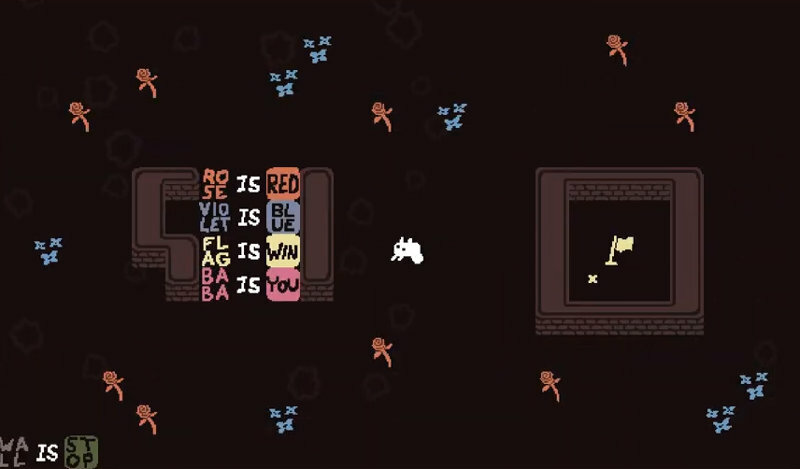 Baba Is You is a tile-based Sokoban-like game where you move and push around objects. Short rules determine how things work in each level, and these rules are themselves physical objects that can be manipulated and changed. The goal is to "win" each level (what exactly it means to "win" is defined by each level's rule set). Both of these are puzzle games. Both require a sort of abstract reasoning about the game's internal logic, which I found very fun. Loosely, they are about the same idea: what if the rules were the puzzle? But beyond that, they are very different games. For this post, I'd like to investigate: how they are similar? How are they different? What makes them fun, and how could other games replicate this fun? Note that there is no text, and basically no instruction aside from a graphic of the mouse with the left button highlighted. This is the real central puzzle mechanic of The Witness: you have to figure out everything yourself. More specifically, the actual puzzles are figuring out what the rules of the puzzles are. The execution (drawing the line from the start to the end) is usually pretty easy. The tricky part is figuring out the constraints you need to satisfy with the path you draw. This pattern continues throughout the game. In each area, there are some simple introductory puzzles designed to guide you to figuring out the main gimmick for that section. For example, one part is about controlling two lines in parallel and getting them both to an endpoint. After this basic rule is taught, you must discover the variation that each puzzle adds- maybe each line has to satisfy a different constraint, or maybe one of the lines is invisible. This is all taught with the vaguest, most cryptic possible hints, so that you slowly figure out the rules over the course of each section. To know the rules of the puzzle is to solve the puzzle. In Baba Is You, the rules could not be more obvious. Each rule is written out clearly in short sentences. If you see the words "ROCK IS PUSH", you know that you can push rocks around by moving into them. If not, you know you can't. It's that simple. But there's more to it than that. There is actually a secret, unwritten rule in every level that "TEXT IS PUSH". The individual words making up the rule sentences can be pushed around like any other block in the game. And when you change the sentences, the rules of the puzzle change with them. If WALL IS STOP, but you push away the STOP, the rule is broken, and you can walk right through the wall. If FLAG IS WIN but the flag is unreachable, just change it so that ROCK IS WIN instead and now you can beat the level just by touching a rock. 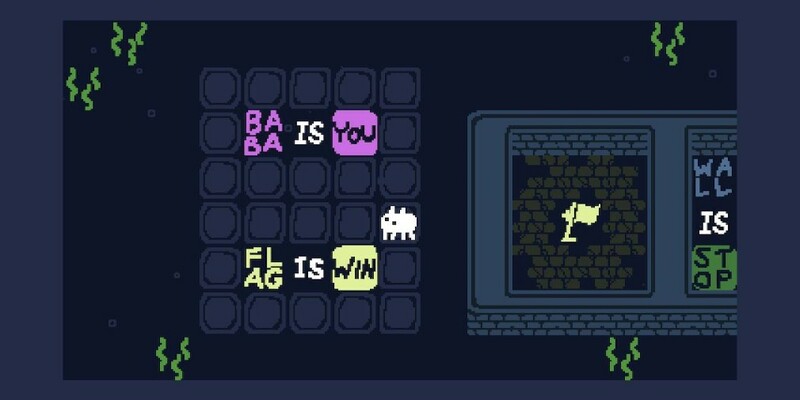 The tricky part in Baba Is You's puzzles is manipulating the rules in order to win. Aside from the first level, almost none of the levels are beatable as presented. You need to figure out how to change the rules, carefully pushing around the text to make new rules that will let you win. Both of these games are about the rules of puzzles. The Witness is about figuring out what these rules are, and Baba Is You is about changing the rules. In both games, the player is constantly learning something new. 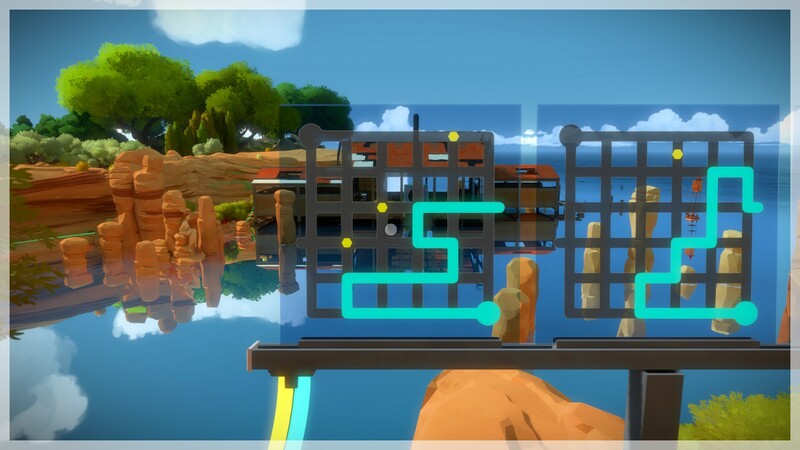 The Witness is always introducing new twists on the rules of its puzzle panels, switching out elements as soon as they become familiar. Every individual panel has something new to teach the player. 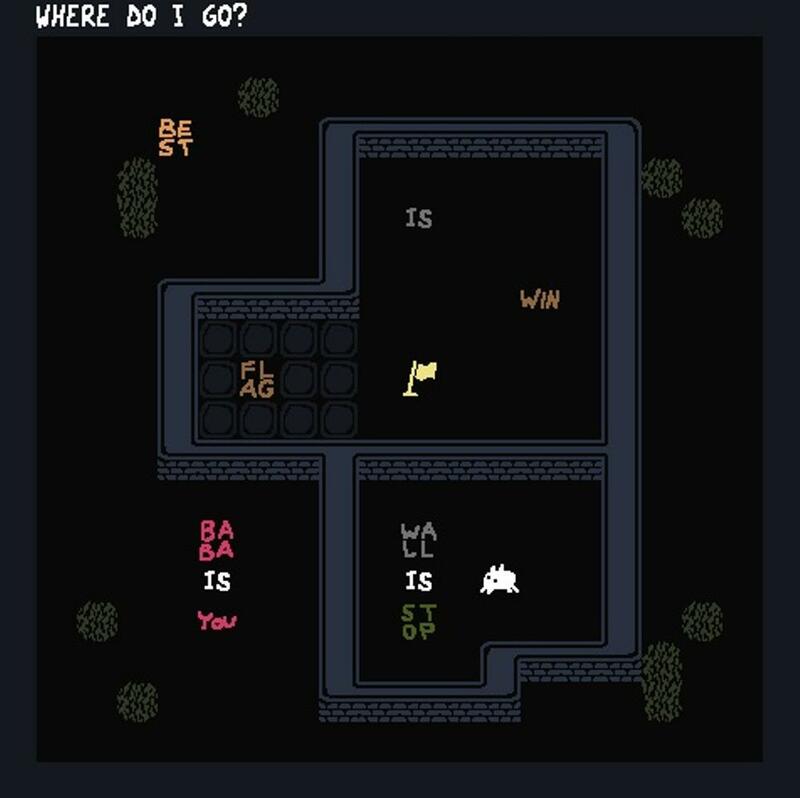 Baba Is You is similar, but how can you teach anything when the player already knows all the rules? Baba solves this by making the teachable moments based around interactions. In one level, you may have to figure out that "[noun] IS [other noun]" is a valid sentence, which will cause objects to change into other types. Or maybe you have to realize that text can be used to indirectly push other objects. Each level contains at least one new insight into how the game's rules fit together. In both games, solving the puzzle is about having an epiphany and discovering something new. Both games are also somewhat cryptic and existential. In Baba Is You, you can break the rule that BABA IS YOU like you would any other. But this means that... nothing is you? The music cuts out and you are forced to grapple with the realization that you have just removed the concept of your own agency from the video game that you're playing, before it reminds you a few seconds later that you can undo your last move. The Witness has no text, no music, and no other humans aside from the stone figures dotted across the landscape. Some of its puzzles even stretch outside their panels- is the whole island part of the puzzle? Why are the puzzles there? Who are you, anyway? Both games have a sort of abstract nature owing to their unique mechanics. To contrast, look at a game like Portal. You're a test subject, you have a gun that lets you teleport, you want to escape the facility. 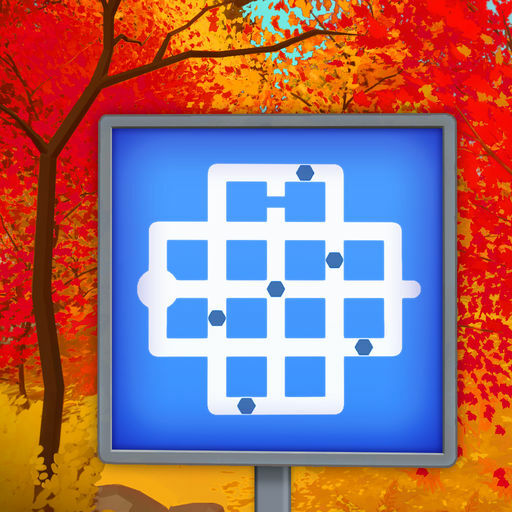 While Portal is fun, and certainly a great puzzle game, it doesn't make you question reality. Its rules are transparent, and fixed- your gun shoots portals, portals teleport you between them, you keep your momentum through portals, etc. and the game explicitly tells you most of these facts. In The Witness the rules are fixed but not transparent, and in Baba the rules are transparent but not fixed. Rules are the very core of a game, and being forced to think and reason about them so deeply is mind-bending and satisfying on a level that is hard for other games to match. When we think of a game's rules, we usually think of static, unchanging things that the player and designer agree on, things like "press A to make Mario jump," or "a worker can move three tiles in a turn." But that assumption can be broken. It takes a lot of design effort, and requires careful guidance of the player, but treating the rules themselves as core game mechanics can lead to incredible and unique games. Breaking this assumption, fascinating designs immediately start to form in my imagination. I think of a platformer where the player can steal traits of objects in the world and swap them around, or a turn-based RPG where the rules for damage calculation are constantly changing. Can you imagine a game where the rules themselves are part of the game? I'd love to hear about it!